Like the award-winning documentary Wordplay, the Putnam Bee was a show about word-nerds, and an unlikely hit. 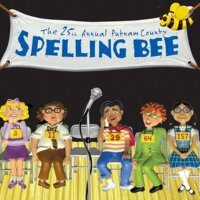 Whereas Wordplay focused on the world of crossword puzzles, this show zoomed in on the American tradition of spelling bees. The whole show takes the form of one long spelling bee, with just the sorts of obsessive and quirky characters we've come to expect from watching the televised finals of Scripps National Spelling Bee each year. Perhaps the most unusual, and entertaining, twist on this musical though, is the audience participation. For each performance, the staff select four audience members to come up on stage and participate in the show as impromptu spelling bee contestants. They are instructed to follow the usual bee-script of asking for a definition, a sentence, and so on, but they are not given any warning of the words they will face. Most importantly, the audience spellers are asked to spell as well as they can, and the cast have no idea which words these improvs will spell correctly. Needless to say, the actors can't stay on stage forever, so the word judges find rather cruel, but highly entertaining, ways to eliminate them — they'll provide ridiculous examples of word usage, mispronounce words, refuse to offer information when requested, or, if really desperate, simply invent a word! The Putnam Spelling Bee has humble roots. The production began its life as an improvisational play performed by a low-key New York improv group. The original title of the play was C-R-E-P-U-S-C-U-L-E, a fancy spelling bee word for 'twilight'. When the potential of the play was realized by a number of experienced theater types, several months were spent working on the play and fleshing it out into a fully fledged stage musical. The show opened, off-Broadway, early in 2005 and did well at the box-office and with critics. So much so that the musical made it to Broadway in April 2005, and went on to do over 1000 performances! To make up for the fact that I didn't get to see this wonderful stage play first hand, I want to live it vicariously through those who did. So below I've collected some of my favorite anecdotes from past performances. In a San Francisco performance of the show (Februrary, 2006) a member of the audience by the name of David Riddle was called up onto the stage to perform as a contestant. Now it turns out that not only can this guy spell, but he was the National Senior Spelling Bee Champion in the previous year! Despite all the usual curve-balls thrown at him by a word-judge determined to send him off the stage so they could get on with the show, David continued to blow them away, dispensing with crazy words like OUABAIN and XEROPHTHALMIA. Finally, they eliminated him with the help of some Norwegian cheese called G-J-E-T-O-S-T. David left off the silent G.
Now I don't usually review something I haven't actually seen myself, but I just wanted to make sure that if/when this musical returns to the stage, us word-buffs will make absolutely sure we don't miss it! But if we don't get to see it, at least we can listen to it .